Creating a natural, environmentally friendly alternative to man-made plastic packaging has led to the award of a Queen’s Award for Enterprise in Innovation to Woolcool. First conceived by founder and CEO Angela Morris in 2001, Woolcool provides a sustainable, superior insulated packaging solution for the transportation of temperature-sensitive goods, for the food, pharmaceutical and healthcare sectors. Woolcool has created more than 40 jobs in Stone, Staffordshire, and their innovative products have led to a major boost for UK sheep farmers – using more than 2 million fleeces a year. The company’s philosophy is based around the concept of Woolcool being ‘created by nature, driven by science’. As a result, more than £1 million has been invested in research and development – supported by three rounds of Government funding via Innovate UK. Many thousands of tonnes of non-biodegradable plastic packaging waste have been saved from landfill by UK customers switching to Woolcool. In the last year alone, Woolcool has prevented the equivalent of 75 Olympic sized swimming pools full of polystyrene from going to landfill. 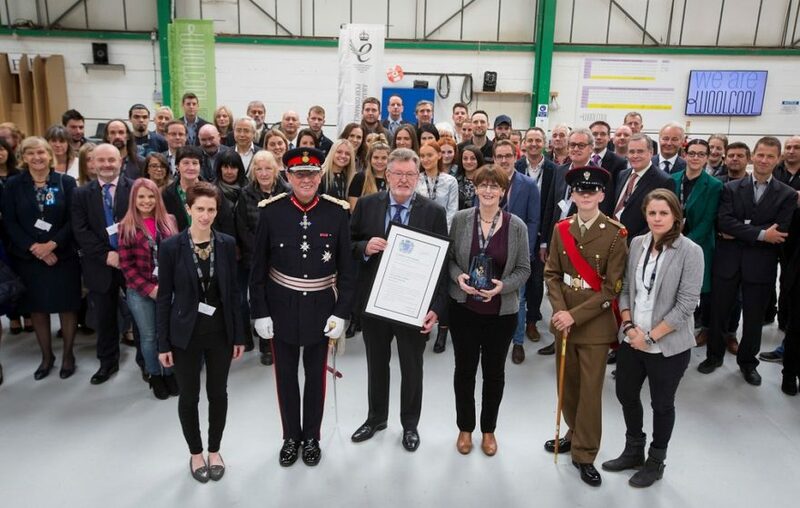 Success was celebrated at an event at Woolcool’s headquarters and packing plant when Mr Ian Dudson, the Lord Lieutenant of Staffordshire, presented the Queen’s Award to Angela. Mr Dudson also praised Woolcool’s faith in Staffordshire. The business has been an enthusiastic supporter of the county’s economy, ensuring that it has created jobs in the local community and used many Staffordshire businesses to supply goods and services. Angela Morris said: “This all started in 2001 when the National Trust wanted to find a natural way for farmers to transport their food to market without the use of polystyrene packaging. We now supply four million Woolcool inserts a year and use two million fleeces. Angela paid tribute to the Woolcool staff for their support in creating a dynamic, growing business. The event, at Woolcool’s base on the Stone Business Park, featured entertainment including fairground games, and the usual party food was replaced with a fish and chip van.